After two decades of health restructuring, access to public health care services in Ontario is suffering. Acute and chronic care hospital beds have been cut in half. While home care has increased and more long-term care beds have opened, extreme levels of hospital overcrowding yield evidence that hospital bed cuts have gone too far. After two decades of hospital cuts, Ontario has the fewest hospital beds per population of any province in Canada. In fact, Ontario is fourth from the bottom of all industrialized countries in numbers of hospital beds per population, followed only by Turkey, Chile and Mexico. 18,500 hospital beds have been cut since 1990. Ontario’s hospital occupancy rate is now 98%, far above occupancy rates in the rest of the industrialized world. Bed shortages have contributed to ER backlogs, cancelled surgeries, high infection rates, and longer waits for care. More than 23,900 people are waiting for placement in a long term care home. New beds are needed in public and non-profit long-term care homes and minimum care standards are needed to ensure adequate care levels. More than 10,000 people are on wait lists for home care. Ontario has the most privatized home care system in the country and is the only province that runs home care entirely through a destabilizing competitive bidding system. Access to front-line medicine (nurse-led clinics, community health centres, nurse practitioners, family doctors, and family health teams) has improved. Continued progress is needed, particularly in underserved areas. Wait times for some treatments and surgeries have improved. Democratic governance of health care institutions and services is being eroded. A living wage is based on the principle that full-time work should provide families with a basic level of economic security, not keep them in poverty. It is the amount needed for a family of four with two parents working full-time to pay for basic necessities, support the healthy development of their children, escape financial stress and participate in their communities. (TORONTO) – The Ontario Federation of Labour (OFL) marked June 1st as Injured Worker’s Day by hosting a media conference and joining a rally at the Queen’s Park legislature to draw attention to the struggles of the thousands of injured workers who are unfairly excluded from Ontario’s workers’ compensation coverage. Twenty-eight percent of Ontario’s employers are currently being allowed to get away without paying into Ontario’s workplace health and safety prevention and enforcement systems. This leaves an estimated 38 percent of Ontario’s workers without Workplace Safety Insurance Board (WSIB) coverage. – Eliminate “deeming” and practices that limit injured workers’ post-injury benefits. Inspired by the recent surge of support for the NDP and the potential for a reshaping of Canadian politics, OFL President Sid Ryan called upon every one of the over one million unionized workers in Ontario to rally support behind Jack Layton and the NDP. Every union leader in the public, private and not-for-profit sectors, labour councils, shop stewards and union and community activists are being urged to get involved in these last days of the campaign. “We represent thousands of trade union activists in every community who will work tirelessly for the next five days pounding the pavement, knocking on doors, staffing phones and convincing their neighbours to put their confidence in Jack Layton’s vision for a progressive Canada,” said Ryan. “If you believe that public pensions and the ability of seniors to live with dignity is more important than fighter jets, then this is your moment. “If you believe that the future and expansion of health care is more important than super jails, then volunteer with your local NDP candidate. “If you want an economy that serves us all – workers, entrepreneurs, mothers, fathers, students and communities – then vote for the NDP,” said Ryan. Over the past year, the OFL has been instrumental in mobilizing thousands of its members in Toronto, Hamilton and Sudbury and across the province on key issues and is redoubling its efforts. “Here’s your opportunity to shape history. Don’t sit on the sidelines. These next days and Election Day is our chance to put the NDP, its leader Jack Layton and provincial candidates over the top,” said Ryan. What kinds of things does an arrogant, corporate government do? Harper has been SO bad SO often that it’s possible to forget some of the terrible things done by him and his right wing reform party. So, to remind you, Frances Ricks, Ph.D (BC) has compiled a list and Peter Boyle has adapted it for our reading enjoyment. Appointed two senators who had 67 forged invoices, falsely claiming tax rebates for election expenses. Is a control freak who has constantly demonstrated his contempt for parliament and the 2/3 of Canadians who have voted against him. If he were to get a majority he would act to gut health care, the CBC and other quintessential Canadian institutions – as he already has the census.Don’t vote for Harper! Recently, over 3500 members of the United Steel Workers walked the picket line for over a year because Vale Inco refused to negotiate a fair contract and instead turned to scab labour to continue production. The use of scabs in this strike, just like so many others, prolonged the hardship and devastated the community. Anti-scab laws have existed in Quebec since 1978; in British Columbia since 1993. Successive governments in those two provinces have never repealed those laws because of the clear benefits to workers and employers. Ontario banned temporary replacement workers from 1993 to 1995. During this same time period investments into the province increased. Since Quebec introduced their anti-scab legislation, disputes have been less violent and a healthy balance between respecting worker rights and mediating a resolution for negotiations exists there. There is growing support for MPP Gélinas’ bill and people will be rallying in Toronto on the day of the final reading. 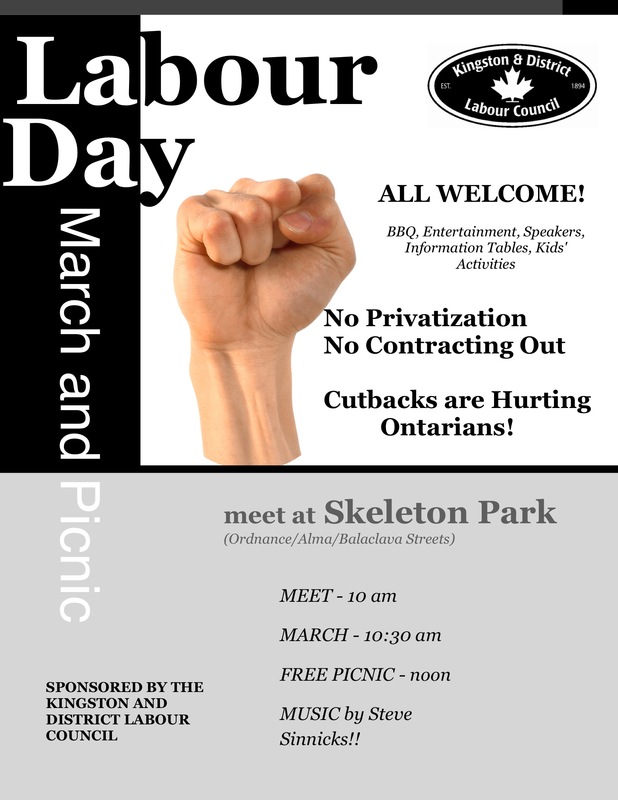 Contact your local MPPs to let them understand that scab labour should not be part of the bargaining process.